Doug White at White Industries in Novato California, (just down the road from us) produces five models of hubs. Our computer system is capable of selling these hubs in pairs according to your specifications, so we are going to discuss each of the bicycle hubs individually. At the end of this White Ind. section, we will provide you with pair prices, and options to make pair "kits" from among these five hub types and their options. 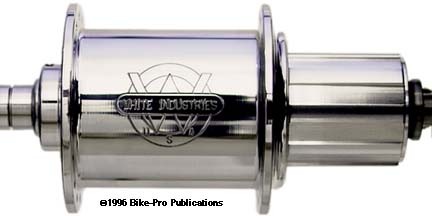 White makes a Shimano compatible cassette styled rear hub. It is capable through changes with included parts to make the hub work as a 7 or 8 speed Road cassette with a 130mm axle, or a 7 or 8 speed Mountain rear hub with a 135mm axle. The hub shell is machined from 6061 aluminum rod. The 48mm outer diameter core of the shell has its interior milled way, hollowing it to reduce a considerable amount of weight. This material extraction performed from the non-drive side leaving a hole around 46mm in diameter. 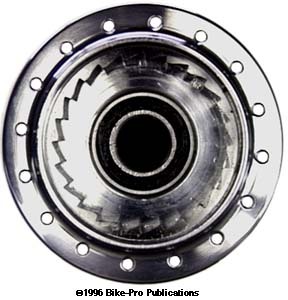 The upper interior of this hole has threads for a machined plug that screws in flush with the outer hub flange. 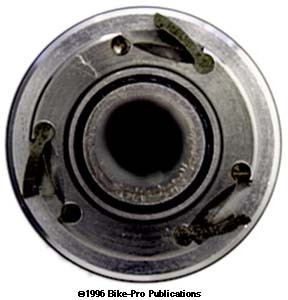 This plug has a recessed cavity for the non-drive side 61901RS sealed cartridge bearing. The recess also houses the locking collar which hold the axle in place using three 2mm hex head set screws accessed through a small hole. The drive side of the hub shell has at its center another of the same 23.5mm diameter bearings lodged 16mm from the outer drive face. Seated within the flange area is a steel ratchet ramp ring with 24 precisely cut ramps.